She's always been one to turn heads. And Sinitta continued to dominate the stage as she flaunted her envy-inducing physique in a barely-there rainbow two-piece during London's Pride Festival on Saturday. The So Macho songstress, 54, almost spilled out of her itsy-bitsy strapless bardot top as she paraded around the stage for her energetic performance. Sinitta's endless stems and perky posterior were on full display in her scanty multicolored bikini bottoms and she confidently danced in sky-high platform heels. The Toy Boy beauty styled her purple-dyed locks in pin straight as she injected even more colour with a vibrant red lip. Sinitta belted her hits to the adoring crowd during her high-octane performance, and shared the stage with X Factor 2016 runner up Saara Alto, who proudly rocked the rainbow on a white cropped T-shirt. Elsewhere, Alexandra Burke certainly garnered lots of attention as she wowed the crowd with an effervescent performance. The Strictly Come Dancing alum, 29, looked sensational in a glittering gold and white fishnet bodysuit, embellished with sequins and cascading tassels. Alexandra put her slender pins and curvaceous behind on full display in the sparkling one-piece and paired her striking look with chic white boots. The X Factor champ styled her brunette mane in corkscrew curls, with dramatic make-up highlighting her effortless beauty. Alexandra let her stunning bodysuit do all the talking as she left the glitzy jewellery at home and added a pop of colour with a vibrant red manicure. The brunette stunner took to Twitter in June to post a message telling fans that 'the timing just wasn't right', with a similar statement also shared on her website. Alexandra was set to embark on a 13-date tour around the UK performing songs from her new album The Truth Is in September, after recently wrapping a stint playing Svetlana Sergievsky in the West End revival of Chess. In the statement Alexandra told fans that after a break away from the UK, she had decided to cancel her tour, but promised more shows would be taking place in the future. She said: 'I just got back after a few days away. I'm really sorry to announce that sadly I had to cancel The Truth Is tour in September. The timing just wasn't right. 'I'm really sorry to anyone who has been inconvenienced by this decision. I love performing more than anything and can't wait to reschedule more live shows in the future. Also stunning on the stage was Sophie Ellis-Bexter looked sensational in a chic midnight blue skirt paired with a saucy black bodice. The Murder On The Dance Floor beauty quaffed her brunette locks into voluminous curls, while colourful make-up highlighted her natural beauty. Sophie accessorised with a glittering gold belt and a quirky red name-plate necklace as she shimmied on stage along with the legion of on-lookers. Elsewhere, Sir Ian McKellan got in amongst the immense crowd in a dapper blue and white spotted dress shirt and khaki chinos. 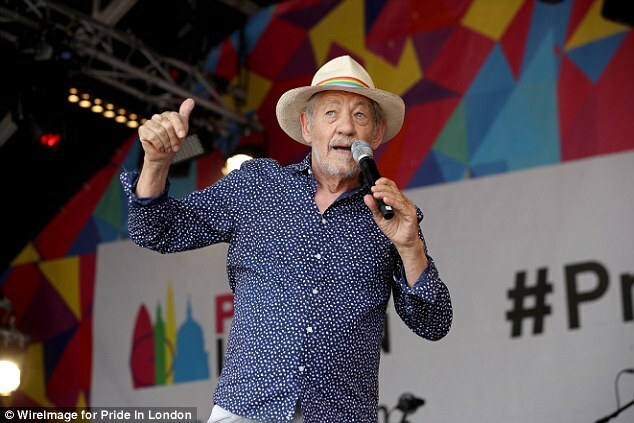 The Lord Of The Rings star couldn't be missed with his rainbow adorned cream trilby, and proudly flew the LGBT flag before hoping on stage to address the excited audience.